Rumour is that Plazacorp has bought the parking lot at the SW corner of Church and the Esplanade and have plans to launch a condo here in 2013. Great news if this was true, completing the streetscape of an already very urban neighhourhood. I have heard rumours about the sale of that lot for many years - it's clearly a potential site) but all have been incorrect. It would be great to see it developed (properly!) but I am a bit sceptical. We shall see. This site was last sold in 2004 to Esplanade 75 Inc. for $7.8Million. Site is 0.6 acres (land area). The City of Toronto Official Plan designates the property Mixed Use Area. The Zoning By-law classifies the property CR T4.0 C4.0 R2.5 which permits a maximum gross floor area equal to four times the lot area. There is a site specific by-law that states that a commercial development of 166,800 square feet is permitted. At the time of sale the property was improved with a Parking Lot. As of February 2004, no applications had been submitted to the City of Toronto Planning Department regarding development of the property. As a result of the land use regulations in place at the time of sale, only a site plan application is required for development to commence. Based on the anticipated time required to complete a standard site plan application, we have estimated the time to development to be approximately two years from the date of sale. The total consideration of $7,800,000 represents a price per square foot buildable of $47, based on the existing Zoning By-law. Our discussions with industry professionals familiar with this transaction indicated that the property was on the market for approximately six months. The asking price for the property was approximately $8,500,000. Subsequent to this transaction the purchaser secured $4,680,000 in new financing from National Bank of Greece (Canada) bearing a nominal interest rate of 6.8% per annum, calculated semi-annually not in advance, repayable in monthly installments of $35,462.71, with a last payment date and balance due date of March 1, 2009, registered on title as Instrument No. AT408444 on February 12, 2004. It is our understanding that the purchaser had no immediate plans to redevelop the property. Furthermore, the vendor had negotiated a five year lease with Unit Park commencing May 1, 2003. The vendor had acquired the property in January 2001 for a total consideration of $5,450,000. It would be great to be rid of the parking lot. What else has Plazacorp built? Anything good? Anything awful? You be the judge. Photo by Red Mars. I have to agree those building are one of the better ones build these days. In fact, that building does more to the area than the other ones. That continue street edge is something that is missing these days with most development. Stand in the park complexs doesn't work. They are building that new building on Adelaide at Princess too, if I recall correctly. So they are mixed bag of tricks. Plazacorp's Uptown Residences is always cringe worthy and has to be mentioned in any discussion of Plazacorp, unless they turn things around and deliver building after building with impressive architecture. Uptown looks like a concrete shell in photo after photo. Wasn't Uptown a Pemberton project? Or was it done jointly? Could this be another joint Plazacorp/Bazis project? I stand corrected, it was Pemberton. 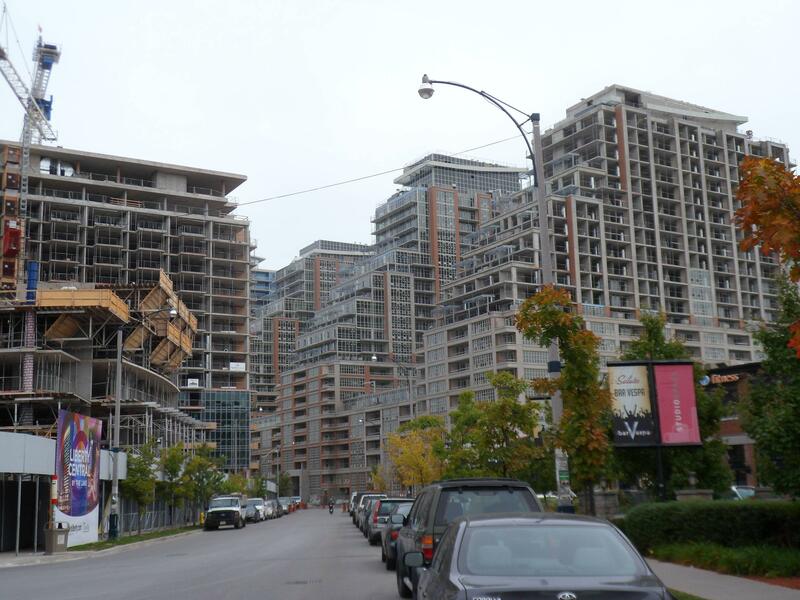 Their portfolio is worse with projects like Park Lake and the blandest recent condos in the Dundas and Kipling area. Plazacorp did the awful University Plaza at 140 Simcoe Street, but otherwise, their history isn't as bad as Pemberton. Their current projects show promise. I think the key to this site, who ever eventually builds there, will be to continue the arcade created by the apartment building and the hotel. Both the community and City Councillor (Pam McConnell) are extremely active working with developers in the St. Lawrence Market neighbourhood so I'm always very optimistic about sensitivity to heritage and what goes up in this area.